Here is a photo I've had for thirty-four(!) years now. 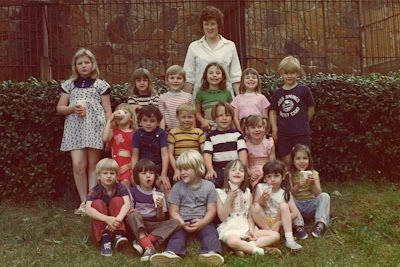 This is Mrs. Tolson's kindergarten class ('75-76) on the annual Little Rock Zoo trip. Mrs. Tolson got to see this, and says it is great to see! She is looking for her pictures now. She laughed and laughed! She said she really appreciates the fact that Aaron has a site like this, and that all these students have a wonderful way to communicate now.